It has been two and a half years since I visited Japan and just as long since I spent time with my old friend Kjell Hahn. He has a new studio set up in Onishi, a little town that is now part of Fujioka in Gunma-ken. The studio is an old two story building that has a wood-shop and ceramics area on the first floor and a painting area along with a clean room on the second floor. Kjell let me use the studio to work on a project for a group show this January at Westchester Community College, Wish You Were Here, curated by Joe Winter who I met as Sculpture Space this summer. Since I do not see Kjell often, I made a piece with him reflecting on the title of the show while referencing our previous collaborations. We found a pile of stuffed animals at a local flea market and selected those that would be true river warriors. With old wood from his house I began to construct a boat that would carry the furry friends safely down the river. 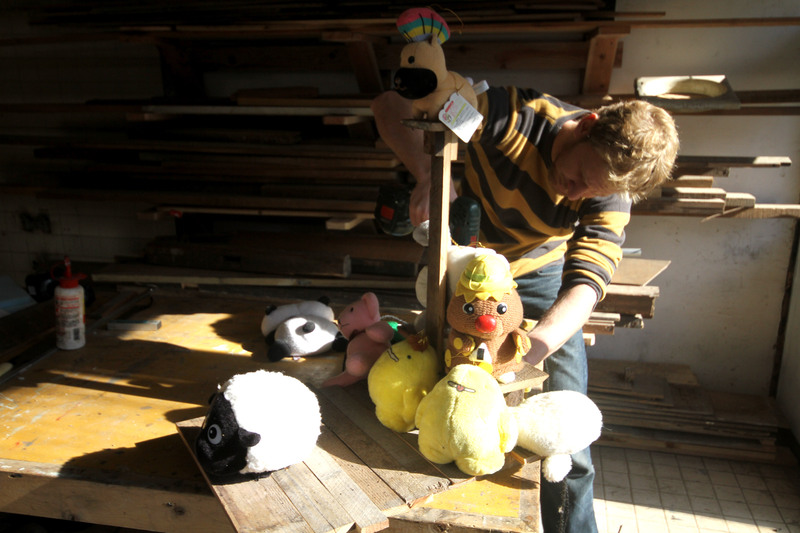 Then we secured some foam to the inside of the boat and tied the characters to the ship with a sheep in the lead. This ship will be sent down the river and we will attempt to retrieve it after it has gone through a bit of rough water and before it goes past the point of no return down river.